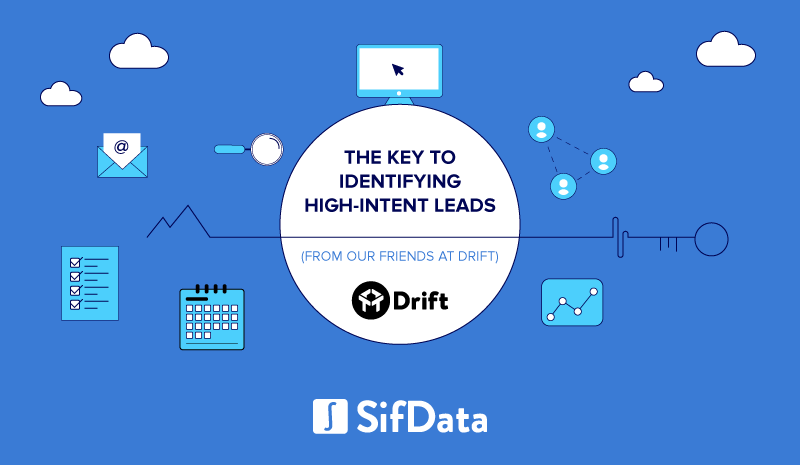 In a world of declining conversion rates and increasing quotas for the modern-day SDR, our friends at Drift, Segment, and Madkudu tell us “How to automagically identify high-intent leads”. 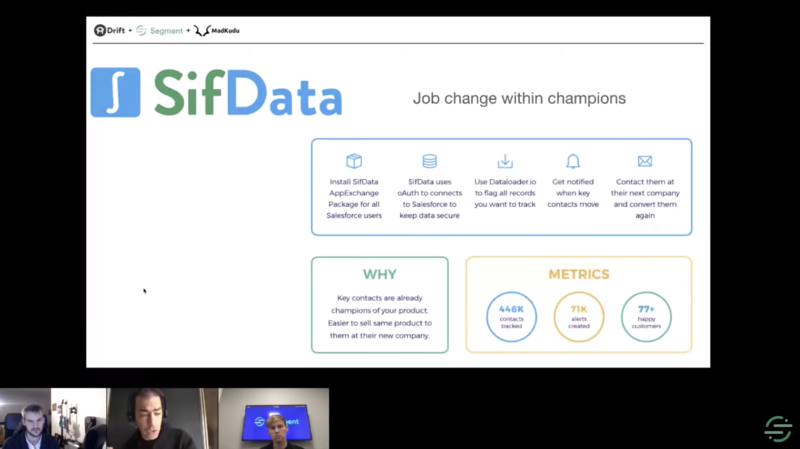 Guillaume Cabane (“G”), VP of Growth at Drift", Liam Boogar-Azoulay, Head of Marketing at Madkudu, and Alex Millet, Personas Product Manager at Segment delve into their genius B2B marketing strategies in their latest 1-hour long webinar (with a special mention of yours truly - SifData). In this blog post, we’ll provide you with a few of their key tips that can help SDRs identify and engage leads before they even contact you. In 2017, 68% of SaaS buyers would rather do product research on their own then speak to one of your SDRs. Why is this? Sales development reps are built to run sales campaigns with a large amount of leads and this negatively affects the quality of sales outreach. So how can SDRs reverse this trend of declining quality while maintaining volume? According to G, the best thing for handling large sales volume while maintaining quality is code. By code, he means using data to create personalized outreach campaigns that convert. MadKudu has built a lead scoring model that uses lead data to capture customer intent before it’s even expressed to you and uses that data to assign each of your leads a score and dollar value (we’ll explain how that works a little later). Your competitors are investing the same budget across the board for every lead, no matter if they’re likely to succeed or not. By knowing which leads are high-intent and low-intent, you can improve the experience based on your leads’ level of intent and outperform your competitors. This kind of lead insight allows you to adjust bid amounts and spend more on marketing for leads that are more likely to convert. This is not a secret science, but simple B2C bid optimization and retargeting. Drift, Segment, and MadKudu take this simple science to another level that’s built for B2B sales representatives. So when is the optimal time to inject motivation in your marketing and outreach campaigns? G mentions that the typical marketer reaches out after the highest level of intent has already decreased, because marketing over-promises and under-delivers. MadKudu’s lead scoring model is able to identify intent by backtracking and discovering the lead’s path towards the final conversion on your website. Drift stores that data in Segment and leverages it to weed out low-value from high-value leads. With all of that data collected from MadKudu’s lead scoring model, SDRs are now able to automate email outreach. In addition to automatically inputting demographics such as company name, location, and persona... Drift is also able to merge intent data like job changes through SifData, or technology changes through Datanyze. Technology through Drift is even able to comb your B2B leads’ website and build custom illustrations based on their logo, color scheme, etc. Wouldn’t it be nice to know which leads are really interested and which are not? By using the marketing strategies discussed in the video, you can capture intent data and use it to create automated outreach through multiple channels that converts better than most SDRs. You can check out the full webinar here to learn more about how MadKudu, Drift, and Segment help SDRs increase conversions and sales volume. Know when key contacts and industry leaders move to different company to help you personalize outreach and convert leads with SifData. Learn more on www.sifdata.com or download our software from the Salesforce AppExchange today.